Medical aid in dying is a medical end of life option that benefits patients and causes no harm. It occurs when a terminally ill, mentally competent adult patient, who is likely to die within six months, takes prescribed medicines, which must be self-administered, to end suffering and achieve a peaceful death. It is now legal in seven states and the District of Columbia, constituting almost 20% of the US population. 1. Medical aid in dying is a proven safe and ethical medical practice. Evidence from states which permit medical aid in dying has unequivocally demonstrated that it works as intended. None of the problems anticipated by opponents have emerged. Twenty years of reports on medical aid in dying from Oregon reveal no serious problems at all. 2. Medical aid in dying is the best end of life option for some patients. Palliative care and hospice can adequately address most, but not all, suffering at the end of life. For those whose suffering can not be alleviated by palliative care, access to medical aid in dying has made the difference between torment and a merciful, peaceful death. 3. Medical aid in dying is not suicide. Suicide is usually done by a mentally ill person who could continue to live, in isolation, often impulsively and violently, and is tragic. In contrast, medical aid in dying is available only to terminally ill patients who will soon die. It is the result of a carefully thought out process that usually takes at least several weeks. It requires consultation with two physicians who must document their findings and it almost always includes support of immediate family. 4. In the United States, there are strict limits on eligibility for medical aid in dying. Where medical aid in dying is authorized, patients must meet numerous eligibility criteria, including having a terminal illness and being mentally competent, as determined by the attending physician and a second, consulting physician. There are numerous other safeguards including at least one oral request and one written request witnessed by two adults. 5. There is no evidence of harm to vulnerable populations. There is no evidence of disproportionate impact on the elderly, people with disabilities, people of color or those without health insurance nor is there any evidence of any coercion or abuse. The Executive Director of Disabilities Rights Oregon stated in 2016 that “DRO has not received a complaint of exploitation or coercion of an individual with disabilities in the use of Oregon’s Death with Dignity Act”. 6. Medical aid in dying helps family members cope with loss. Studies show that family members of those who request medical aid in dying feel better prepared and are more accepting of the death, and that there are no negative effects. 7. In states where it is legal, medical aid in dying is rarely used. Only about one in three hundred deaths occur in this manner in states where the practice is legal. And about one third of patients who obtain the medications do not take them. However, dying patients are comforted knowing that this option is available. 8. 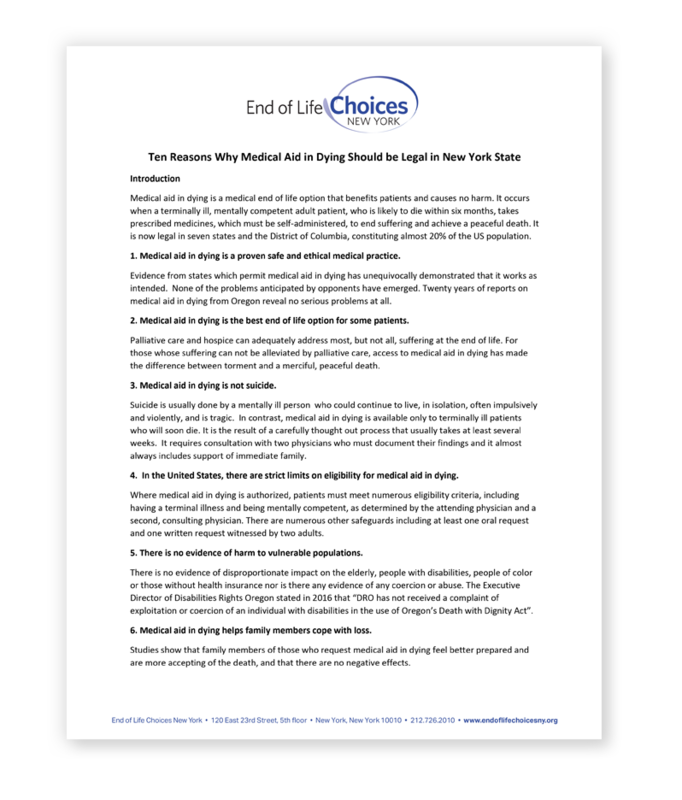 A substantial majority of New Yorkers support medical aid in dying. A 2018 Quinnipiac poll revealed that New Yorkers support medical aid in dying by a 2 to 1 margin (63% to 29%). A majority of both the Democrats and the Republicans polled support medical aid in dying. 9. Most doctors support medical aid in dying. Physicians in New York support the Medical Aid in Dying Act by more than a 3 to 1 margin, 67% to 19%, according to a recent poll, and a number of medical organizations have shifted from opposition to neutrality. The New York Academy of Family Physicians supports medical aid in dying. 10. There are no valid arguments as to why mentally competent, terminally ill patients should not have the right to medical aid in dying. Medical aid in dying is a safe, ethical medical practice. Opponents continue to raise fears, concerns and speculations. Years ago, when there was relatively little experience with the practice, this was understandable. However, evidence accumulated in the past two decades demonstrates that there is no real basis for such concerns; the arguments raised in opposition to medical aid in dying have been refuted. Indeed, the open discussions between doctors and patients that are encouraged by such laws have led to a general improvement in end of life care, with more patients seeking and obtaining palliative care and hospice management, regardless of whether they ultimately elect medical aid in dying. Please write your legislators and ask them to support the S. 3947, A. 2694 Paulin/Savino Medical Aid in Dying Bill.